Those who know the mountain heights understand that it is not simply the beasts of the peaks they have to beware of—it is also the dangers of the very land. But even they know better than to cross the path of a hungry pack of avalanche wolves, whose howl can bring the very mountains down atop their prey. 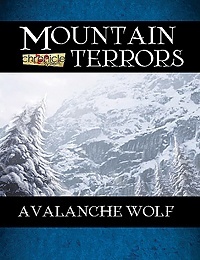 Mountain Terrors: Avalanche Wolf is a bestiary PDF for the Chronicle System, the rules engine that powers our popular A Song of Ice & Fire Roleplaying game. Get it today for just $1.29! We have posted two new PDFs for the Chronicle System, the rules that power our A Song of Ice and Fire Roleplaying game. 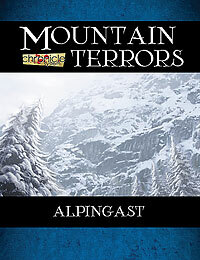 Mountain Terrors: Introduction is free, and Mountain Terrors: Alpingast is only $1.29. In the heights of the world, dangers await. Whether those dangers take the form of bone-biting cold, ever-hungry predators, avalanches, or even creatures from the darkest of stories the common folk tell, this invaluable resource provides what you need to tell stories in the soaring, wild mountain terrain of your Chronicle System campaign. It doesn’t seem that long ago that we were waiting to find out if the Y2K bug was going to destroy civilization, but somehow it is 2015 already. This is a milestone year for Green Ronin Publishing. We are now officially 15 years old! It was in February, 2000 that I decided to take the plunge and start a new company. By July we had our first game out (Ork! The Roleplaying Game) and then a month later we launched Death in Freeport, the book that really put us on the RPG map. Certainly I had no idea at the time that Green Ronin would be still be publishing 15 years later. So a million thanks to all of the gamers who have kept us going, as well as the legion of writers, artists, editors, and other professionals we’ve worked with over the years. We could not have done it without you! So what do we have planned for 2015? Glad you asked! We are starting our Dragon Age line off with a bang this year. We are releasing a Core Rulebook, which replaces the game’s previous boxed sets (all of which are out of print). The Dragon Age Core Rulebook consolidates all the material from Sets 1-3 into one big 400 page book. It replaces the Set 1 adventure with a new one, since we figure The Dalish Curse is the most played Dragon Age adventure out there. There is a small amount of other new material (monsters, specializations), but the bigger change is that the game no longer assumes you are fighting through the Fifth Blight. That is one option of many campaign frameworks. The setting has matured quite a bit since the release of Dragon Age: Origins, so we thought it made sense not to tie the game to one particular time or event. 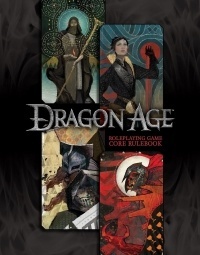 The Dragon Age Core Rulebook is in layout now and will be going up to BioWare soon for approvals. After that we’ll be releasing a new version of the Game Master’s Kit, since the old one is outdated and out of print. The new one updates the screen to represent the full game rules, and includes a new adventure as well. Then we have a sourcebook tentatively titled Inquisition that incorporates material from the recently released Dragon Age: Inquisition video game. As many of you no doubt know already, that game introduces a huge amount of new content and we want to bring as much of that as we can to the tabletop game. Lastly, we turn to Faces of Thedas. This was originally a PDF series that focused on characters from the Dragon Age setting. Jack Norris, our line developer, is revisiting Faces of Thedas, this time as a full-on book. After three video games and several novels and comics, the setting has a lot of memorable characters and we want to bring more of those to the game. GMs can uses these characters in a variety of ways, and you can even play them if you want to. Since we first released Dragon Age, people have been asking us if we were going to release the game system—known as the Adventure Game Engine—separately from the setting. The answer is yes! Our plan for this year is to release Fantasy AGE, a core rulebook for the system that I am working on right now. This will be strictly a rule book with no attached setting. The core of the game will be well-familiar to Dragon Age fans but there are some differences, the biggest of which is the magic system. That of Dragon Age was meant to emulate how magic works in Thedas, so I am modifying it heavily for Fantasy AGE. Our goal is to release Fantasy AGE in May. Then at the end of July we will release the game’s first setting book. This is our big GenCon release and part of something super exciting … that I can’t talk about yet. This will be the focus of our GenCon presence this year and perhaps the biggest RPG story of the year. Watch for an announcement in a few months. It is a great time to be a superhero fan, that’s for sure. We’ve got movies, TV shows, and Mutants & Masterminds! We’re starting out the year with The Cosmic Handbook, which developer Jon Leitheusser recently turned over to production. If you liked Guardians of the Galaxy, you’re going to love this book! Our other big project is Freedom City, the signature setting of Mutants & Masterminds since 1st edition. Now Freedom City will come to 3rd edition at last, in a book similar in format to Emerald City. We’ll also be continuing the Atlas of Earth-Prime. This is a PDF series we started last year that describes the world of Freedom City and Emerald City in greater detail. When we’re done, we’ll collect the PDFs up into a print book, as we did with titles like Power Profiles and Threat Report. The Atlas of Earth-Prime should resume in a few weeks. Our Pathfinder plans have begun to bear fruit under the auspices of developer Owen K.C. Stephens. 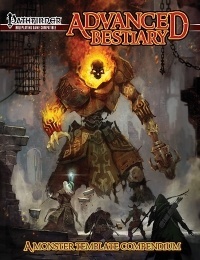 At the end of last year we released the Advanced Bestiary to terrific reviews. If you are a Pathfinder GM, you should seriously check out the Advanced Bestiary. It’s a tremendously useful resource that makes every other monster book you own more valuable. We’ve also sent Freeport: The City of Adventure to print. This monstrous tome is the biggest book we’ve ever published. 544 glorious, full color pages detailing a setting that goes back to Death in Freeport 15 years ago. It’s classic fantasy + pirates + Lovecraftian horror. Lots of great Pathfinder content too: new classes, feats, spells, and more. The pre-order for Freeport is still going on, so you can get the PDF for only $5 if you pre-order the book now. The follow-up is already in the works. Return to Freeport will be a six-part adventure series perfect for kicking off a new campaign. We will release this as a PDF series over the course of the year and then collect it up into a print book when it’s finished. We have two releases planned for A Song of Ice and Fire Roleplaying this year. The first is Dragon’s Hoard, a 160-page adventure. This is written and edited and has been submitted for approval. Meanwhile, developer Joe Carriker is working on a Player’s Guide for the game. This is a rules companion with expanded options for, well, just about everything. As always with this game line, I must caution patience. We can’t really predict how long approvals will take, but will do our best to get these books out as soon as we can. Joe has also been working on a series of PDFs in support of the Chronicle System, the game engine that powers A Song of Ice and Fire Roleplaying. We’ve released three of these already: Woodland Creatures, Out of Strife Prosperity, and Chronicle of Sorcery. The latter introduces a magic system for the game for the first time, so is well worth a look if you missed it. Expect more bestiary PDFs this year, as well as some other surprises. 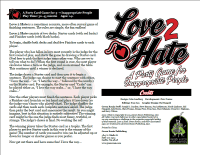 Last but by no means least is our first party card game, Love 2 Hate! We ran a successful Kickstarter for the game last year and it is scheduled to release in April. The rules are now online and you can learn to play in like two minutes. This game is obviously quite different from our usual RPG fare, but it’s a hoot and we hope you check it out. At the start of this article, I mentioned our very first release: Ork! The Roleplaying Game. Well, it hardly seemed fair for Freeport to be the only 2000 release to get some love on its fifteenth anniversary, so watch out for a new edition of Ork! The Roleplaying Game this summer. Original mastermind “Crazy” Todd Miller has revisited this beer and pretzels RPG, so you can expect even more psychotic mayhem. That is quite a lineup, but believe or not, there’s more! Nothing we can talk about right now unfortunately, but stay tuned for some exciting announcements over the coming months. What has Steve Kenson been working on the last five months? Find out in April! Thanks for a great 15 years. Join us in 2015 for a host of gaming goodness! As I’m finishing up the last round of edits for the very large A Song of Ice and Fire Roleplaying adventure series titled Dragon’s Hoard, I thought I’d talk a little about our playtesters. In an ideal world in which tabletop roleplaying games were one of those massively financed entertainment industries, we’d have a crack team of paid testers whose day job is to pick apart the stuff we write and improve on it. Having worked in the video game industry before, I can say it was always kind of great to be able to shoot one of the testers an email, ask them to kick the tires on the latest build and get immediate feedback. The reality of our industry, of course, is that we don’t quite have the ability to maintain something like that. We’re lucky, though, in that our industry has a consumer base that’s filled with people who love being part of the process, as well as getting the chance to see some of the material that’s coming out for their favorite game ahead of schedule. Hence, our playtesters! The playtesters for A Song of Ice and Fire Roleplaying are a pretty diverse lot, with folks in the United States, Canada, Europe, and Australia. They’re not just individuals—when I put my playtesting cadre together, I solicited for entire groups of playtesters. Which of course only makes sense: playtesters aren’t just beta readers, but are people who will take the rules that they’re given and put them through the process of actual game play. Playtesters look for a couple of things. Rules solidity is of course a big one. We need to make sure the rules we’re using are on-target, whether newly created rules that need to be balanced against the rest of the system, or just making sure we’re using our already-existing rule-set consistently. But playtesters do more than that: they also play through the material to make sure it’s actually enjoyable to play. At the end of the day, we’re creating games for people to enjoy, and that’s the first and last litmus test of our creative process: Is This Fun? Everything else is secondary to that. Each playtesting group has its own personality, which is fantastic. Some groups are more interested in consistency of material to the book canon, for instance, while others are very strict rules people. Frankly, having this kind of diversity of gaming interest is to our benefit, and we’re grateful to these volunteers for the work and passion they put into these games. drop me a line. It’s a simple process, involving the signing of a Non-Disclosure Agreement, and a little conversation between us. We’ve got plenty of really great upcoming material that’ll need its tires kicked, so if that sounds interesting, drop me a line! I’d love to hear from you. 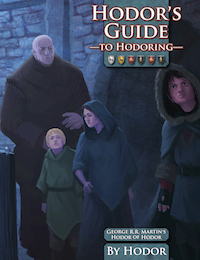 It came down to the wire, but we were just able to finish up the latest product for A Song of Ice and Fire Roleplaying: Hodor’s Guide to Hodoring. We’ve been working on this for a long time and we think you’re going to appreciate the usefulness and depth of this book. Best of all? It’s free and you can download it now. Hodor!